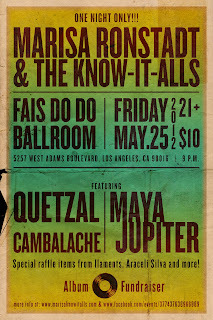 As the original Know-It-All, I'll be playing with Marisa Ronstadt and the Know-It-Alls on Friday May 25th. This is to raise some money in order to finish our album. Great lineup, great giveaways, come on out! Raffle items from Araceli Silva, Ilaments and more!